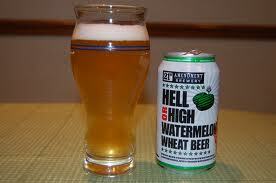 Nothing says summer like watermelon and beer. Known for creating innovative brews and creative monikers, the San Franciscan 21st Amendment Brewery marries summer’s favorite fruit with the season’s most beloved beverage. This American wheat beer is brewed with real fresh watermelon, resulting in a crisp, dry and refreshing brew with just a kiss of watermelon aroma and flavor. Available from April through September, it’s packaged in a can, making it easy to transport to your outdoor summer excursions. At only 4.9 per cent ABV (alcohol by volume), it’s light enough to allow one to kick a few back while enjoying a warm summer day.